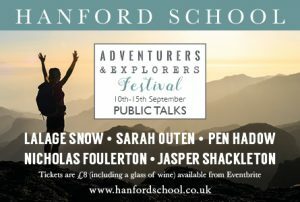 Welcome to the inaugural Hanford Adventurers and Explorers’ Festival – an action-packed week, aimed to encourage us all to ‘Give it a Go’ . Hanford girls are famous for their sense of freedom, fun and fearlessness. So, it seemed only natural that we should share this love of teamwork, creativity and courage by hosting an event specifically dedicated to our love of adventure. Nicholas Foulerton – Motorcyclist who has clocked up 120,000 miles and 83 countries, including his recent expedition from Argentina to the Arctic. Lalage Snow – an award-winning filmmaker and photographer who visits gardens in areas of conflict. Sarah Outen – a TED speaker and adventurer by land and sea. Jasper Shackleton – recreated Captain Bligh’s journey home after the Mutiny on the Bounty. Pen Hadow – Renowned pioneer explorer and conservationist whose iconic solo trek from Canada to the North Pole has never been repeated. We must never forget that ordinary people achieve the most extraordinary things with initiative, drive and a curious mind.